Toddler sign language can be used to develop social and language skills (even though they are a bit older than your typical infant). Toddlers can speak a few words, but still have many times when they are unable to express themselves to their satisfaction. Many of the infamous “terrible two’s” tantrums are a result of complete and total frustration over the inability to express emotions or feelings. Toddlers can learn Toddler Sign Language, which makes communication easier and more effective. A child having a tantrum is a miserable as the parents feel trying to cope with the emotional rage. Anything that gives a safe outlet for emotional expression can only be beneficial. Is it Too Late to Teach my Toddler Signs? Some parents wonder if Toddler Sign Language is appropriate to teach even after the child has begun talking. The answer is a resounding “Yes!” Toddlers typically have a pretty small vocabulary. Baby sign language, adapted to accommodate a toddler’s accelerated learning stage, can fill in the vocabulary voids. A toddler will happily and gratefully use both verbal and signing skills. There are other significant benefits to teaching Toddler Sign Language. We all learn differently. Some people learn best through hearing, while others are more visual learners. Baby Sign Language uses both hearing and seeing to teach - the best of both worlds. A parent saying the word out loud and signing the word at the same time teaches a child critical learning skills in a way that best suits his or her learning styles. Signing with your toddler also improves IQ and language abilities. Using sign language for toddlers has another benefit. It can help teach your toddler to learn to read. Toddler sign language helps a child connect the word gestures with printed letters. Signs help preschool children increase their vocabulary. Because the word is spoken while signing, phonetic sounds are taught. When using a book while signing, letters are taught. The development of these early literacy skills usually translates into exceptional performance in school, even at the preschool age. But research has shown these early skills benefit the child throughout their school years and not just preschool and kindergarten grades. Teaching Toddler Sign Language raises interest in spelling also! In addition, word recall is improved. If you teach baby sign language to your infant and expand the program to Toddler Sign Language, the result will most likely be a child who becomes a reader all his or her life. No need to fear if you are concerned that teaching Toddler Sign Language will slow down your young child’s language skills development. In the toddler stage you can add more complex baby sign language words and add more complex sentences. Teaching Toddler Sign Language is similar to teaching a second language to a child. Even as your child begins to talk more, you may still encourage the continued use of sign language. It is a legitimate language and having the skill throughout life gives your son or daughter an additional qualification for securing employment in the future! If you look ahead, the potential is unlimited. As your toddler develops a larger vocabulary and begins to talk more and more, odds are he or she will typically start signing proportionately less and less. That is only natural. But many parents discover that infants taught baby sign language will naturally progress to Toddler Sign Language and beyond. Even at four and five years old, children tend to sign without thinking twice about it. Toddler Sign Language can fill the vocabulary gaps and make it easier for your child to communicate. This is emotionally and intellectually satisfying for both parents and their toddlers. Do you use Sign Language with your Toddler? Please share your toddler signing experiences here! your little one? How long have you been signing? What do you specifically love about using sign language with your little angel? 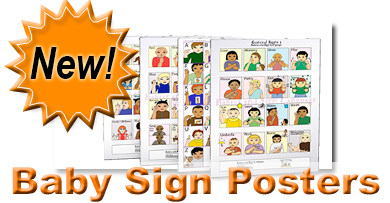 Click here to see other toddler sign language stories! Your story will appear on our baby signing web page exactly the way you enter it here. TIP: Since most people scan Web pages, please try to include your best thoughts in your first paragraph. Do you have a picture of your darling little one using a sign (to add)? Great! Please click the button and find your photo on your computer. Then select it! How young can my baby start learning sign language? I live in the UK, what signed language should we use? Which signing style should we/our baby use? Questions? Comments? Would love to hear from you!